Magistrates Francesco Depasquale (left), Joanne Vella Cuschieri and Aaron Bugeja are expected to be promoted judges soon. 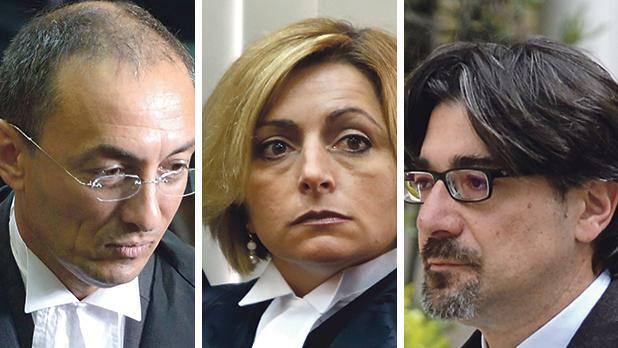 Three judges and three magistrates will be named in the coming weeks despite repeated promises by the government to change the “outdated system” of appointments, the Times of Malta is informed. In what legal practitioners describe as “a big rush to fill vacancies with more appointments before a new system is put in place”, three sitting magistrates will be promoted to judges and three lawyers will be appointed to sit in the Magistrates’ Court. Magistrates Aaron Bugeja, Joanne Vella Cuschieri and Francesco Depasquale are expected to become superior court judges. Nadine Lia, Bridgette Sultana and Victor Asciak are being named as the new magistrates. This will be the second time that three magistrates will be promoted concurrently, a move interpreted by legal practitioners as “a subtle message” to sitting magistrates their promotion still depended on the government, at least for the time being. The last time a lawyer was directly made judge was in 2016, with the appointment of former Labour Party deputy leader Toni Abela. Dr Bugeja, a former lawyer at the Attorney General’s office who shot to the limelight a few months ago when tasked to conduct an inquiry into whether the Prime Minister and his wife owned Egrant, a Panama company, had been appointed magistrate in 2013. Legal sources said he had also applied for the post at the European Public Prosecutors’ Office. The nominee is expected to be chosen by a government-appointed selection committee soon. Dr Vella Cuschieri is expected to be the first full-time judge to serve in the Gozo Courts. She was made a magistrate in 2014 after unsuccessfully contesting the elections on the Labour Party ticket a year earlier. Legal practitioners wondered why the job was not offered to Magistrate Paul Coppini, who had been serving in Gozo for decades. Dr Depasquale, appointed magistrate in 2011, will follow in his father’s footsteps. Judge Franco Depasquale had retired in 2003 and he was replaced by Joe Azzopardi, who was appointed Chief Justice last year. The three new judges would be leapfrogging other magistrates who have been serving for longer periods, the legal sources noted. Among the new magistrates, the most controversial appointment was likely to be that of Nadine Lia due to her connections with the Labour Party, they added. She is the daughter-in-law of Pawlu Lia, Labour’s veteran lawyer who sits on the Commission for the Administration of Justice and also acts as the Prime Minister’s personal legal counsel. Dr Lia was put on the government’s payroll during the past few years with various advisory appointments, including to Economy Minister Chris Cardona. Dr Asciak, the son of Environment and Resources Authority chairman Victor Asciak, and Dr Sultana, legal affairs director at the Health Ministry, are also expected to be named magistrates. These appointments meant more than half of the judiciary would have been replaced in the past six years, most of the appointees being close to the party in government in various ways, the sources noted. Apart from Dr Abela, the government appointed the former editor of the Labour Party’s newspaper KullĦadd, Lawrence Mintoff, the president of the Labour Party’s Gozo branch, Grezzju Mercieca, and Consuelo Scerri Herrera, sister of the Environment Minister, among others. Among the 11 magistrates appointed so far by the current administration, three are former Labour candidates – Dr Vella Cuschieri, Joe Mifsud and Monica Vella – two are the daughters of former Labour MPs – Yana Micallef Stafrace and Caroline Farrugia Frendo – and others were employed in the private offices of Labour MPs who are lawyers by profession. The government has come under increasing pressure to change the system of appointing members of the judiciary, which has been in place since the 19th century, to ensure it was no longer directly involved. Both the EU and the Council of Europe have recommended a reform and a judicial reform committee had suggested a new system in 2013. The Prime Minister and the Justice Minister have repeatedly said they would implement changes “soon”, however, these have yet to happen. As things stand, judges and magistrates are effectively chosen by the Prime Minister.